Here is your first look inside the shelter. 449.925 and 147.27 are on the left. On the right side (front to back) we have the IRLP computers and DStar repeater, a work bench, then the remaining equipment: APRS, 52.81 rx, 447.875, and 927.7. The 53.81 repeater operates split site, with its transmitter at the MMRA Marlborough East site, and the receiver here at Marlborough West. Both the 6m receiver and UHF link transmitter are in Mastr II cabinet. For more information about the 6m transmitter, see our page on Marlborough East. The 147.270 repeater has been operated by MMRA since 2003. It was acquired from another amateur radio group who had operated it for at least 20 years prior as a tenant in MMRA's shelter. 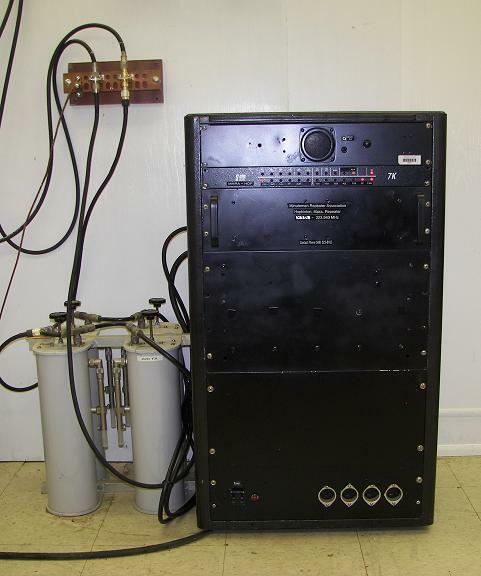 When acquired, this repeater was a Motorola base station repeater controlled by an ACC RC-850 controller. 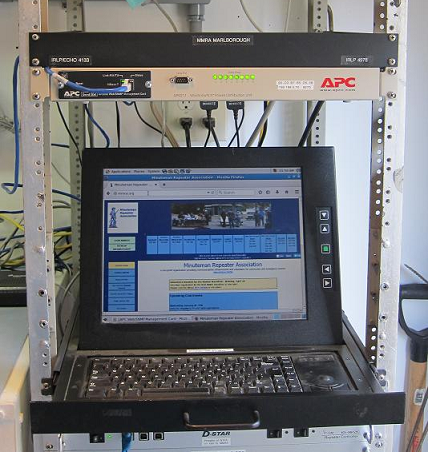 This equipment was retired, and replaced by a GE Mastr-II base station and SCOM 7K controller. The 7K controller was replace in 2017 with an SCOM 7330 controller. This unit also operates the 223.940 repeater and the link transceiver. Interestingly enough, the 147.270 repeater is linked to the hub via RF, even though the hub repeater is in the same shelter about two feet away. Although a hard-wired link is possible, it requires an additional port on the hub's controller, and increases the overall complexity of the system. The link transceiver is dual channel and can be set remotely to link to either HUB1 or HUB2. 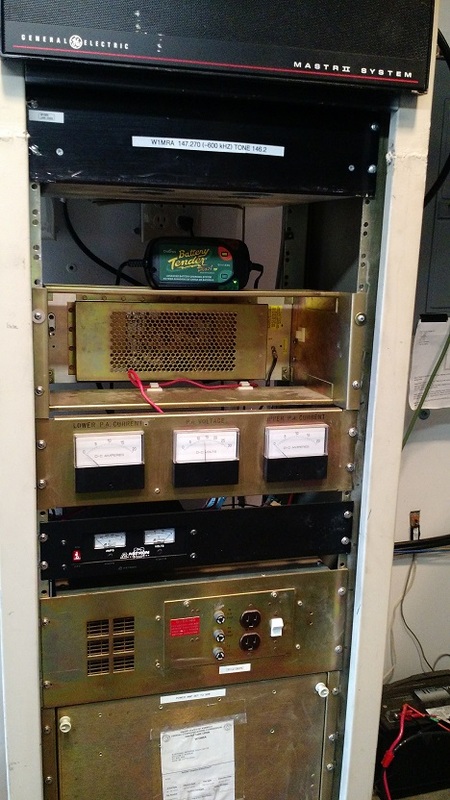 By the way, the ACC RC-850 controller was sold on eBay and is now operating a repeater in Southeast Australia! 147.27 is equipped with battery backup power and can operate thirty to sixty minutes during a power outage. 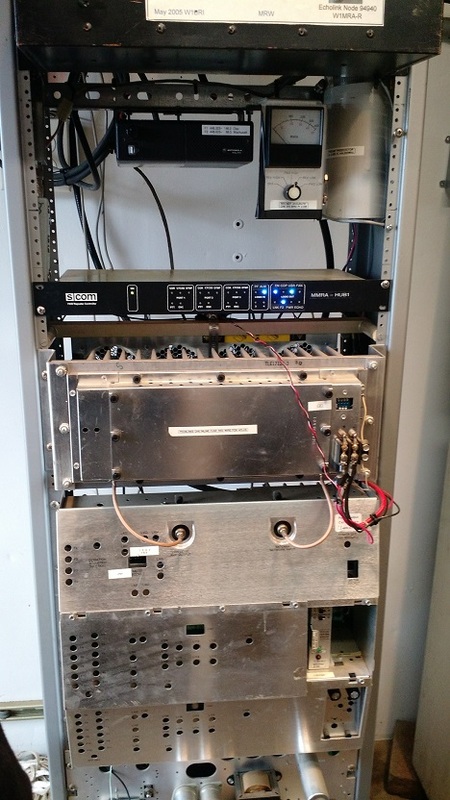 On March 1st, 2019, the 223.94 repeater at MMRA's former Hopkinton site was relocated to Marlborough west. The repeater consists of a 250mW Motorola Micor Exciter. This goes through a 6dB pad to an intermediate power amp (IPA), which boosts power to 17W. At this input level, the 100W RF Concepts final amplifier, puts out 50 Watts. The receiver is made by Hamtronics. "W1MRA B" is the newest addition to the Marlborough site. On loan from N1PA, this is the second D-STAR repeater sponsored by MMRA. 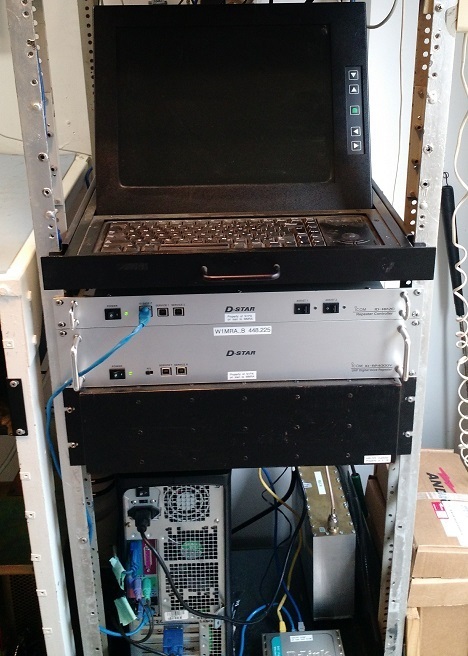 Below the ICOM stack, you see the duplexer, and below that the Dell workstation in service as the gateway. This is the center of MMRA's network. All repeaters in our network link through here. At the top in the photo is the backside of the duplexer. Below this you can see the Motorola M120 link radio, which allows '925 to link to 446.325 in Brookline or 448.625 on Mount Wachusett in Princeton. There is also a small receiver cavity on the right. The SCOM7330 is next. Below this controller, you see the guts of the Motorola Compa-station: TX, card cage, receiver, and power supply. 449.925 is equipped with battery backup power and can operate thirty to sixty minutes during a power outage. MMRA's 927.7 is a Motorola Quantar repeater. An SCOM 7K is the controller for this system. The finals on this repeater put out close to 100W. Coupled to a PD809Y antenna 180 feet up, this repeater has a wide range. 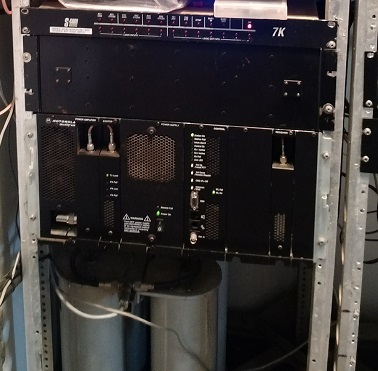 This repeater is IRLP node 4978 and full-time linked to the NEAR-900 network, a collection of 900 MHz repeaters throughout Massachusetts that are linked through an IRLP reflector. The duplexers you see at the bottom are for 224.88. MMRA hosts an APRS repeater at this location. It is a Kantronics KPC-3 Plus TNC and a 100W GE Delta SX mobile transceiver running at 50W. Since the early to mid 2000's, two IRLP nodes have operated from this site. The current nodes are based on Raspberry Pi Model B processor boards and are contained in the black 1U cabinet above the APC power controller. They were placed in service in 2016 and replaced the 1990's era "White Box" PCs on which the original nodes were built. Photo of original nodes.